1. Prepare Dough: In small microwave-safe bowl, heat milk, juice and syrup in microwave oven on medium (50% power) 2-1/2 to 3 minutes or until mixture reaches 120 to 130°. Stir in yeast and let stand 3 to 5 minutes or until foamy. 2. In large bowl, whisk flours and salt. Make a well in center of flour mixture. Add milk mixture to flour mixture; with wooden spoon, stir until a shaggy dough forms and all of the flour is incorporated. 3. Spray large bowl with baking spray. Dust work surface and hands with flour. Turn dough onto work surface; with hands, knead dough until smooth and elastic, about 15 minutes. Place dough in prepared bowl; lightly spray top of dough with baking spray. Cover loosely with plastic wrap; let stand in warm place 1 hour or until doubled in size. Dough is ready when indentation remains when pressed with 2 fingers. 4. Prepare Cinnamon-Sugar Coating: In small microwave-safe bowl, heat milk and butter in microwave oven 1 minute or until butter is almost melted; stir until butter melts. In medium bowl, stir brown sugar, granulated sugar and cinnamon until well combined. 5. Spray 12-cup Bundt pan with baking spray. Transfer dough to work surface; punch dough down. Divide dough into 6 equal portions; cover with plastic wrap. Working with 1 piece at a time, form dough into an 8-inch rope, then cut rope into 8 equal pieces and roll each piece into a ball. Dip ball in milk mixture, then roll in sugar mixture to coat; place in prepared pan. Repeat with remaining dough, milk mixture and sugar mixture, loosely layering balls in pan. Sprinkle any remaining sugar mixture over top. Cover loosely with plastic wrap; let stand in a warm place 1 hour or until almost doubled in size. 6. Preheat oven to 350°. Bake bread 25 minutes. Cool bread in pan on wire rack 5 minutes, then invert bread onto large serving plate. 7. 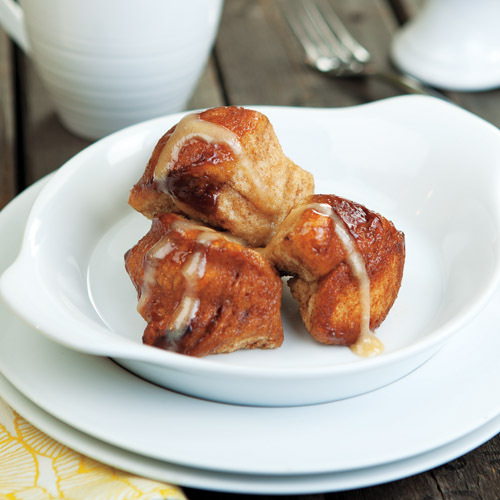 While bread cools, prepare Glaze: In small bowl, whisk together powdered sugar and cheese until smooth. Gradually whisk in juice and vanilla extract. Makes about 1/2 cup glaze. To serve, separate bread into balls and spoon glaze over each serving.